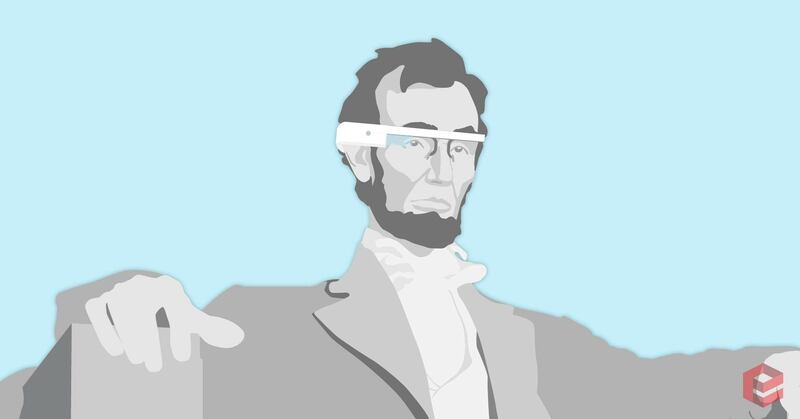 Will Google Glass enable “augmented advocacy” in a more transparent society? One of the more interesting aspects of Dave Eggers’ dystopic new novel, “The Circle,” is the introduction of the “SeaChange,” a small, powerful camera that can transmit wireless images to a networked global audience. The SeaChange is adopted by politicians who “go transparent,” broadcasting all of their interactions to the public all day long. Regardless of whether that degree of radical transparency in beneficial for elected representatives or not, in early 2014, we’ve now seen many early glimpses of what a more networked world full of inexpensive cameras looks like when United States politicians are online and on camera more often, from scandals to threats to slurs to charged comments that may have changed a presidential election. Most of that video has been captured by small video cameras or, increasing, powerful smartphones. Over the next year, more people will be wearing Google Glass, Google’s powerful facial computing device. Even if Google Glass has led to a backlash, the next wave of mobile devices will be wearable, integrated into clothing, wristbands, shoes and other gear. This vision of the future is fast approaching, which means that looking for early signals of various aspects of it is crucial. One such signal came across my desktop earlier this week, in the form of a new app for Google Glass from RedEdge, a digital advocacy consultancy based in Arlington, Virginia. Their new “augmented advocacy” application for Google Glass is a proof of concept that demonstrates how government data can be served to someone wearing glass as she moves around the world. It’s not in the GDJ Store but people interested in testing it can request the Glass application file (android 1) from RedEdge, its maker. The app leverages Google Glass’s ability to detect the wearer’s location, feeding a government data through RedEdge’s API to populate a relevant card. It pulls in from open data, formatted as JSON, and provides a list of all locations. Visitors to the White House with this app, for instance, could call the White House switchboard, though they would be unlikely to get President Obama on the phone. 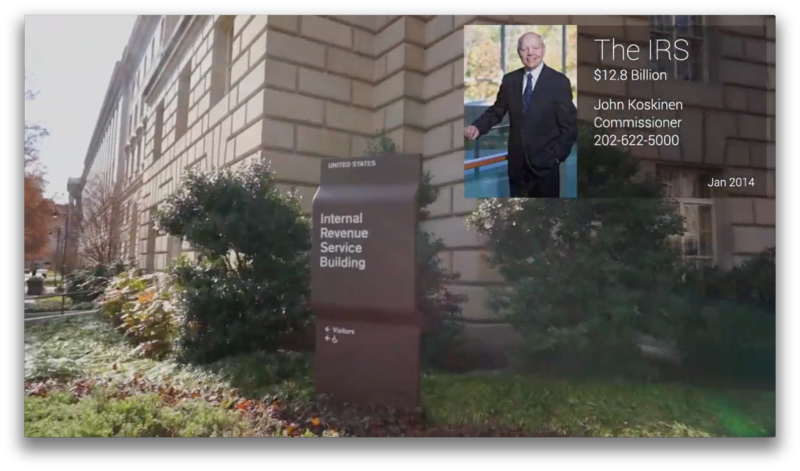 One potentially interesting application of augmented advocacy might seem to be Congress, where data from the Sunlight Foundation’s Influence Explorer or Open Congress could be integrated as the Glass wearer walked around. The technical limitations of Glass, however, mean that citizens will need to keep downloading Sunlight’s popular Congress app for smartphones. That doesn’t mean such precision might not be possible in the future. As Spencer highlighted, app developers can determine “micropositioning” through wifi or Bluetooth, enabling triangulation within a room. “A classic example comes from marketing in a store –” I see you’re looking at X,” he said. That technology is already live, as Brian Fung reported in the Washington Post: stores are using cellphones to track shopping habits. In Washington, a more palatable example might be around the Mall, where geofences and tracking trigger information about Smithsonian paintings, trees, statuary, or monuments. When more apps like this go live in more devices, expect some fireworks to ensure around the United States and the world, as more private and semi-public spaces become recorded. Glass and its descendents will provide evidence of misbehavior by law enforcement, just as cellphones have in recent years. The cameras will be on the faces of officers, as well. While some studies suggest that police wearing cameras may improve the quality of their policing — and civil liberties advocates support their introduction — such devices aren’t popular with the New York City Police Department. As with the dashboard cameras that supply much of the footage for “Cops” in the United States and offer some protection against corrupt police and fraud in Russia, wearable cameras look likely to end up on the helmets, glasses, lapels or shoulders of many officers in the future, from Los Angeles to London. The aspirational view of this demo is that it will show how it’s possible to integrate more public data into the life of a citizen without requiring her to pull out a phone. A more dystopian view is that people will see a huge budget number and call the switchboard of a given agency to angrily complain, as opposed to the constituent relations staff of their representatives in Congress. Given the challenges that Congress already faces with the tidal wave of social media and email that has swelled up over the last decade, that would be unhelpful at best. If future digital advocates want to make the most of such tools, they’ll need to provide users with context for the data they’re being fed, from sources to more information about the issues themselves the progress of existing campaigns. This initial foray is, after all, just a demo. More integration may be coming in the next generation of wearables. 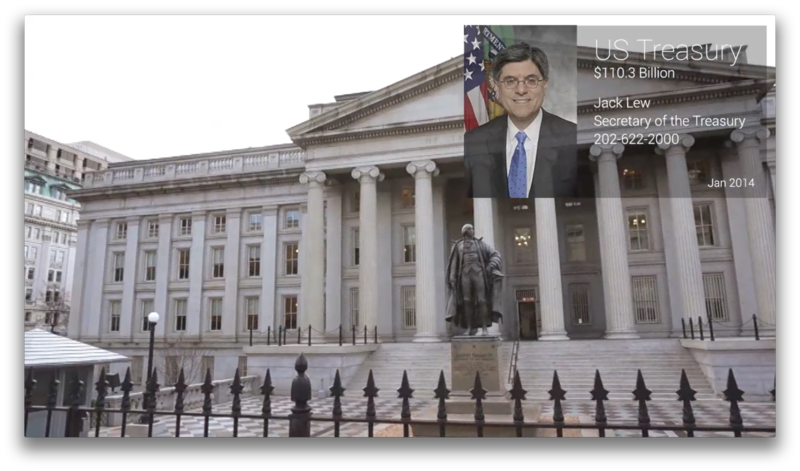 @digiphile @ustreasury cool – I'm actually working on a @googleglass app to answer any question civomega / @SunFoundation can answer! 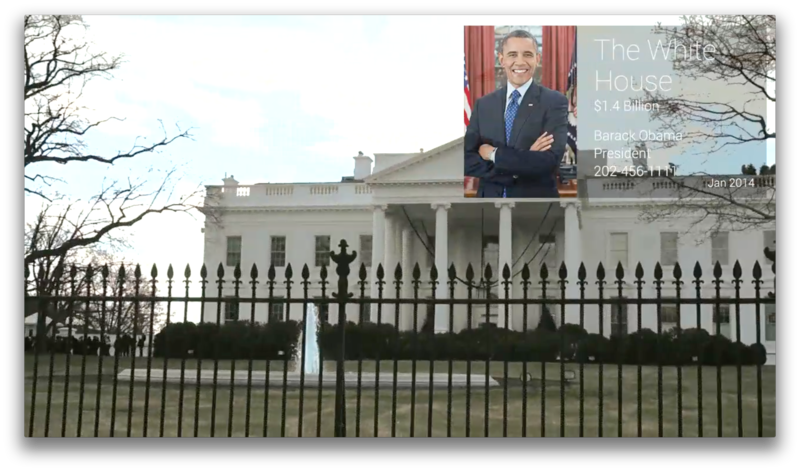 Will White House epetitions drive change or disillusionment? An epetition for The White House that really worked? Yep. P.J. Vogt, a producer for NPR’s “On The Media,” was surprised to find that a “We the People” epetition had played a role in the FCC moving to make a deal with wireless carriers that will allow consumers to unlock their cellphones. He’s not alone. Historic lows in trust in the federal government mean that any progress toward a positive outcome — like legal unlocking of mobile devices — is viewed skeptically in public discourse. Should carriers actually allow consumers to unlock those devices, it would be the the open government platform has now played a role in U.S. history. I’ve been following the White House epetition system since it launched, more than 2 years ago. Prior to the 2012 election, this open government effort was a relatively slow burn, in terms of growth. Until the fall of 2012, the most significant role it had played came in January of that year, when the White House took an official position on petitions on the Stop Online Piracy Act (SOPA) and PROTECT IP Act (PIPA), changing the political context for the bills. As I’ve observed before, on the evening of December 20, 2012, however, President Barack Obama responded to 32 different e-petitions related to gun violence. It was the first direct response to an e-petition at The White House by a President of the United States. While this remains the only e-petition that the President has responded to personally, before or since, it was a milestone in digital government, marking the first time that the President spoke directly to the people through the Internet about an issue they had collectively asked to be addressed using the Internet. By January 2013, it had 5 million users. Now, there are over 10 million. It’s the first open government platform to reach that scale of use, in no small part due to the epic response to the Death Star petition that drew both Internet-wide and mainstream media attention. And here’s the thing: most of those users are satisfied with the responses. Not all of them have resulted in policy shifts — in fact, only a few have, like a rulemaking on online puppy mills — but the ones that did are significant: SOPA/PIPA, increasing public access to scientific research online, and supporting consumers unlocking their mobile devices. More challenging requests lie ahead. 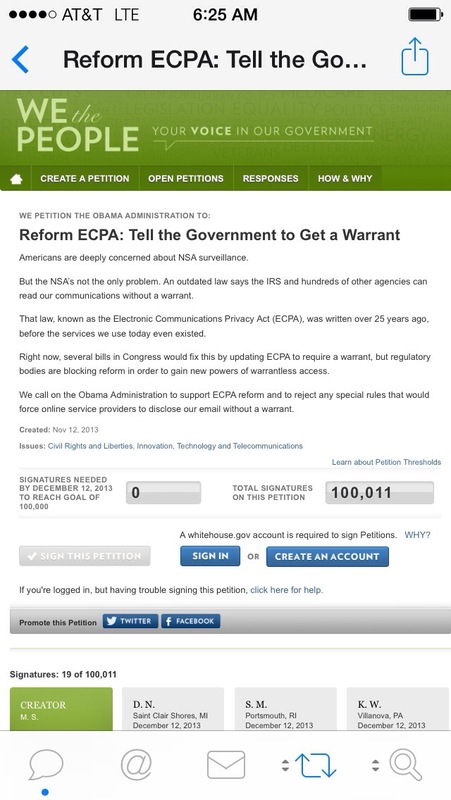 An epetition for the administration to reform the Electronic Communications Privacy Act just passed the 100,000 signature threshold this week, requiring a response. The epetition will join a dozen or so popular online petitions that have passed the threshold, some of which have lingered unanswered for over a year. This tardiness of response might lead critics of the administration to conclude that this White House putting off public responses to popular petitions it finds politically inconvenient, like the one to pardon Edward Snowden. Even if that’s the case, if this trend continues, these epetitions from the American people look a bit less like a useless exercise in democracy theater at week’s end. In 2014, the White House has announced a plan to launch a public version of the application programming interface (API) for “We The People,” enabling third parties to build applications on top of it. Should mainstream adoption continue, American citizens may find a bonafide means to exercise their right to petition the United States government for the redress of grievances in the public desire of the twenty-first century. One of the persistent concerns about Healthcare.gov regards the security of the federal health insurance exchange marketplace, as I reported for Politico Magazine this month. At least one glaring security flaw remained unpatched until the end of October. 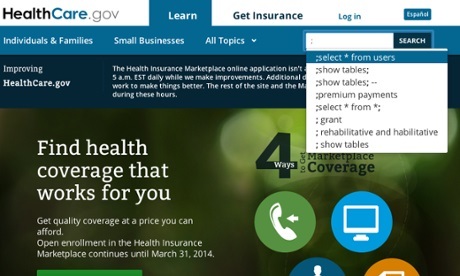 Despite the “big fix” announced on December 1, the security of the website and the backend systems behind it have not only remained in doubt, given issues that have come out in Congressional testimony but have now become the subject of contentious exchanges between the United States House Oversight Committee and the Department of Health and Human Services, which operates them. Despite this letter, it’s not clear whether the Healthcare.gov security concerns that TrustedSec has highlighted have been addressed. 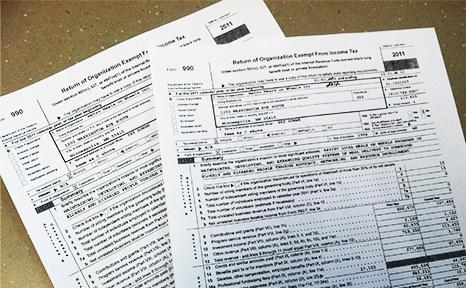 Given the continued focus of Congressional committees on the issue, expect more assessments and audits to emerge in the future. 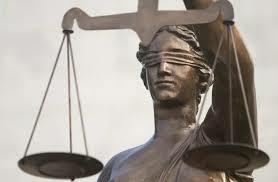 Taken in sum, the Guardian holds that these FISA court opinions show that the NSA demonstrated disregard for the privacy protections that are constitutionally afforded to American citizens under the Fourth Amendment. On the one hand, the intelligence community’s Tumblr blog and Twitter account have been an effective means of distributing and publicizing the document releases it is publishing on odni.gov, its website. That’s a measure of transparency, although the redacted, scanned documents are not “opening the kimono” all the way. On the other hand, if you only read the ODNI’s press release and posts at that tumblr (which are quite similar,) you wouldn’t know that the documents released are not only pursuant to President Barack Obama directive to DNI Clapper to declassify information relevant to NSA bulk data collection. 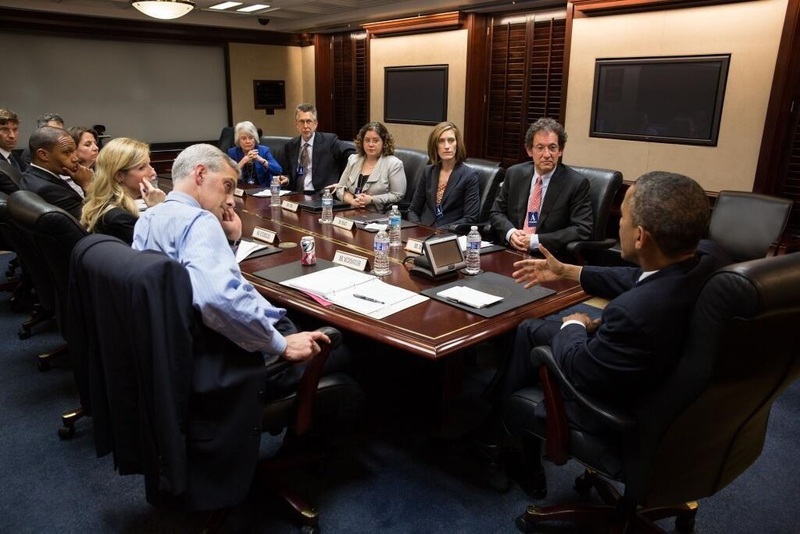 So, this is what "open government" looks like in 2013: networked, nuanced and opaque. Official documents are released in response to the reports of whistleblowers, and then distributed through the government's official channels online and reported, factchecked and through the 4th and 5th Estates. This dynamic only bound to get more interesting from here on out.